Funny thing about the Knicks. If it’s possible for a franchise to be simultaneously overrated and underrated, the New York Knicks are that franchise. This is a franchise draped in past achievement and self-importance – 2 championship teams, the most recent being 38 years ago, 2 utterly unwatchable trips to the finals since, local media attention that far outpaces anything warranted by on-court achievement and despite what Tony Kornheiser and Mike Lupica try to tell you, no more than 3 or 4 truly GREAT players in their history. However, I’ve lived in Manhattan for the last 5+ years, during which I’ve had an opportunity to observe up close the Knicks’ relationship with the city, and I must say it’s fascinating and frankly difficult not to root for. While the Knicks are pretty much irrelevant to today’s NBA landscape, the franchise’s glory days fortuitously fell in the Yankees’ post-Mantle, pre-Reggie days, capturing a generation of fans. To hear true Knicks fans (not the media!) relive experiences with their team – and not just in the best of times – is to realize that there’s something special here. If you ever get the opportunity, as an older Knick fan about Walt Frazier, Micheal Ray, Bernard King or young Ewing. While the Knicks’ glory days as far, far in the rearview, I find myself rooting for a Knicks’ renaissance because, man, I wanna see what this town’s like when the Knicks are good! A champion, true floor general, great all-around guard and one of the great ballhawks of his era. On the floor, Clyde’s perhaps best remembered for almost single-handedly winning Game 7 of the 1970 Finals (the Willis Reed game) against the Lakers, hitting 12-of-17 from the field and all 12 of his free throws, and finishing with an awesome 36 points and 19 assists. He led the Knicks second title team three years later, averaging 21- 7.3 rpg- 5.9 apg (21.9- 7.3- 6.2 in the playoffs). 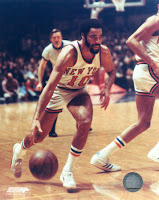 In addition to being one of history’s great big-game guards, Clyde was a 7-time NBA All-Star (MVP in1975), named to the All-NBA First Team four times and the All-Defensive First Team seven times. Frazier held virtually several franchise records –games played (759), minutes, points (14,617), field goals attempted & made, FT attempted & made and assists – nearly all of which (Frazier’s assist record still stands) were ultimately broken by Patrick Ewing. While there could only be one choice for this spot, Knick have some talented guys running the point in the years since Frazier’s departure. In 300+ games in the late-1970s and early-1980s, Micheal Ray Richardson 14.2- 6- 7.1 with 2.6 steals. A few years later, Mark Jackson – Brooklyn-born and a quintessential NYC PG – won the 1988 Rookie of the Year award as a Knick, averaged a solid 11.1 ppg and 8 apg and quarterbacked the first two 50-win teams (and division winners) of the Patrick Ewing era. Jackson’s ranks as the best non-Clyde PG in Knicks history. Finally, we have Stephon Marbury, who stacks up well statistically, but it’s no contest. Frazier scores an easy victory, as he’s got team success and iconic status in New York, while Steph, well, doesn’t. Bronx-born Guerin led the Knicks in the late-1950s and early-1960s and was one of the first-ever MSG fan favorites. 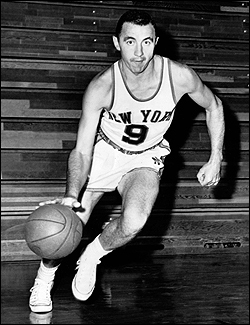 Guerin was an outstanding backcourt scorer – he remains the only guard to average 20+ ppg for his entire tenure as a Knick, including 29.5 ppg in 1961-62 – a solid passer and smart playmaker, and an excellent rebounder, averaging 6.4 rpg in his time with the Knicks. He led the Knicks in scoring three times and in assists for five consecutive seasons, set franchise single-game records for scoring (57 points in 1959; topped by Bernard King’s 60 on Christmas Day 1984), assists (21 in 1958; bested by 22 from Chris Duhon in November 2008) and played in six consecutive NBA All-Star Games (1958-63). While his teams didn’t enjoy a great deal of success, Guerin statistically outperformed scoring guards from the Knicks’ brighter days. He still owns the highest scoring average among guards in Knicks’ history, along with better rebounding and assist numbers than Houston (18.1- 3.1- 2.5), Sprewell (17.9- 4.1- 3.8) and Earl Monroe (16.2- 2.6- 3.5 – I know he was on the downside, but I really expected Monroe’s numbers to be better). An NYC classic. 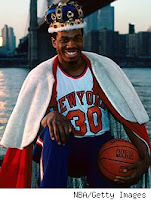 A native of Brooklyn, Bernard King was one of the most devastating scorers in NBA history – strong and explosive on the break and possessing a great mid-range game Despite only spending a short time with some otherwise unmemorable Knicks teams, is held in as high a regard throughout the Boroughs as any of the all-time greats. I mean, just check out the picture! Would you guess that guy only played ~200 games, made the playoffs twice in three years (24 wins in the third) and never got past the second round? King led the NBA in scoring in 1985 with 32.9 points per game and was selected twice to the All-NBA First Team and three times to the NBA All-Star Game. In January 1984, King became the first player in 20 years to score 50+ in consecutive games, (50 each on January 30 & 31, 1984, v. Spurs and Mavericks). Eleven months later, on Christmas Day 1984 at The Garden, Bernard torched the Nets for franchise-record 60 points. As breathtaking as he was in the regular season – and despite only modest team success – it was in the 1984 playoffs that King catapulted himself to the rarified status he still hold today in NYC. In a dozen postseason games, King averaged just under 35 ppg, and his 5-game Round 1 duel against Isiah Thomas and the Pistons in which he averaged 42.6 ppg remains must-see TV for any NBA fan. Despite starting his career and spending most of his career (6.5 seasons, v. 5.5 in NY) with the Detroit Pistons, DeBusschere’s remembered almost exclusively as a Knick – and a beloved one at that. 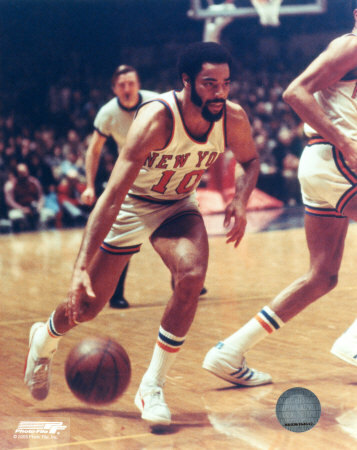 A vital member of the 1970 and 1973 squads and a tireless worker in the paint, he personified the toughness of the Knicks’ championship front lines. Made the All-Defensive First Team the first six years of its existence, went to 5 consecutive All-Star appearances for the Knicks in the early-1970s, and was extremely durable (missed 11 games in his first 4 full seasons in New York) and consistent. Other Knicks’ PFs (Spencer Haywood, Ken Sears, Charles Oakley, Larry Johnson) had no chance. A tough call. Not decision-wise – based on the combination of statistics and team success, it was not terribly difficult to give the nod to Willis Reed. 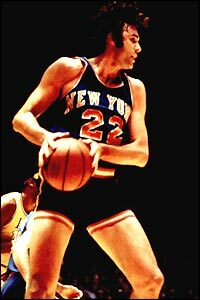 In his time as a Knick, Reed was not only a Rookie of the Year, an MVP (1970), a 7-time All-Star and a two-time champion (Finals MVP both times), but he was, by all accounts, among the toughest players ever to set foot in the NBA. While he’s undoubtedly a deserving champion and was the leader of 1970 Knicks, a single game has come to define too much of the legacy of a talented-but-tough-as-nails star. Even when discussing that very postseason, a 2-for2 performance Game 7 v. L.A. is always brought up, while Reed’s near-25-15 in the previous 17 postseason games get glossed over. That’s quite the resume, right? How, then, is this a tough decision? Because with a twist of fate (a Michael Jordan sprained ankle or a Game 7 John Starks jumper), Patrick Ewing would have a place in the Reed-Frazier-DeBusschere pantheon. 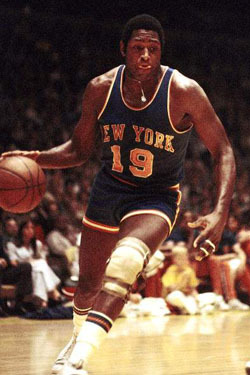 While Willis Reed most famously played with pain, halfway through his career Ewing’s knees had started to go and would never be the same. Patrick Ewing was the superior offensive player (22.8 ppg, 50.8% FG), both in terms of skills set and stats, but thanks to his leadership, team success – and maybe a twist of fate – earned him this spot.